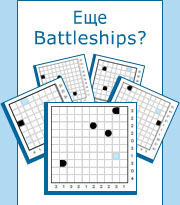 Each Battleship puzzle represents an ocean with a hidden fleet of ships, which may be oriented horizontally or vertically within the grid such that no ship touches another, not even diagonally. The numbers on the right and on the bottom of the grid show how many squares in the corresponding row and column are occupied by ship segments. Occasionally some squares may contain given ship or water segments to help start the puzzle. The object is to discover where all ships are located.